Contributes an IRES-ECFP cassette as the 3’-module during MultiSite Gateway cloning of a bi-cistronic mRNA shared with a two-part fusion protein encoded by the 5′- and middle modules. ECFP translation is mediated by an IRES. 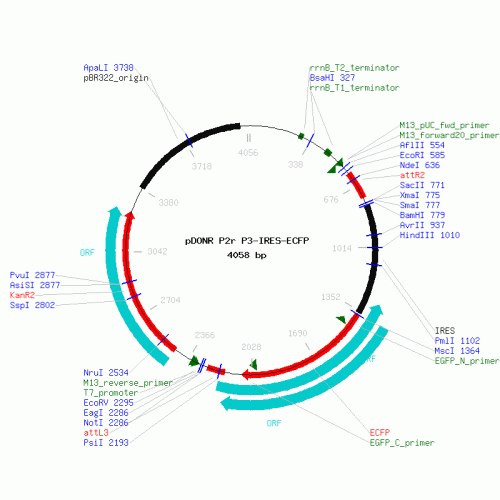 Contains a stop codon at the end of the ECFP sequence. 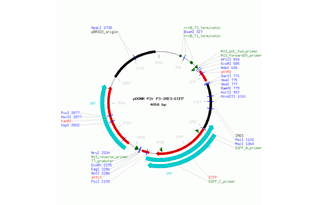 There is a nucleotide difference at position 1265 between our sequencing of this plasmid (A) and the reported sequence for the pYIC plasmid used as template for the PCR amplification of the insert (G). We have not confirmed whether this is related to the PCR. Nevertheless this is part of the IRES sequence and not the ECFP coding sequence.